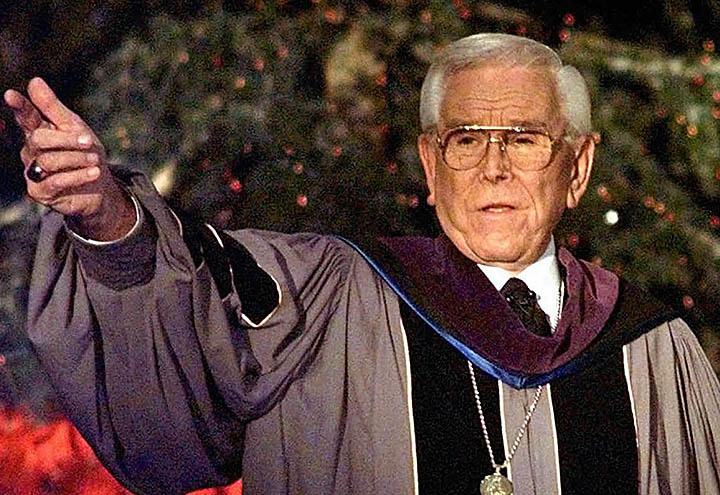 Famed televangelist Robert H. Schuller, a native of Alton, has passed away after a battle with esophageal cancer, according to his family. The former pastor of “Hour of Power,” which he hosted from his Crystal Cathedral in Garden City, CA, was 89. Schuller was born on a farm near Alton on Sept. 16, 1926, and was told by his uncle — a minister — that would become an evangelist, just days before his fifth birthday. He graduated from Newkirk High School and then studied at Hope College and Western Theological Seminary, were he received his divinity degree. Ordained in the Reformed Church in America, he first served as pastor of Ivanhoe Reformed Church in Riverdale, IL, before moving to California. He opened Garden City Community Church, holding services at a drive-in movie theater, in 1955. Construction began on the Garden City Community Drive-In Church in 1958 and was completed in 1961 at a cost of $3 million. The unique facility allowed Schuller to preach to congregants who both drove in and walked in. Schuller’s ministry focused on what he felt were the positive aspects of Christianity. He authored 37 books, most of which fall under the self-help category, and was often quoted as saying, “If you can dream it, you can do it.” The famous 13-story Tower of Hope addition to the church, then the largest structure in Orange County, CA, was built in 1968. After purchasing additional property adjacent to the church, construction began on the final Crystal Cathedral arrangement that same year, and the new facility was dedicated in 1980. “Hour of Power” began broadcasting from there in 1970. It is now broadcast from the former St. Callistus Catholic Church campus. Schuller married his wife, Arvella, in 1950. They had a son, Robert A. Schuller, and four daughters: Sheila, Jeanne, Carol and Gretchen. Both Robert and Sheila served as senior pastors of Crystal Cathedral, that role is now held by his grandson — Robert A. Schuller’s son — Robert V. Schuller. Arvella passed away last year.